As an advance notice for all you junkies of the newspaper science section, this coming Tuesday in a major national newspaper there will be a story about lepidoptera, that's butterflies and moths, and the people who collect them. This is an opportunity to plug the research I do and share some information about the growing world of "your own backyard." Earlier this week a reporter came to my university with Dave Wagner of the University of Connecticut to do a piece about collecting caterpillars, moths, and butterflies. Dave Wagner is an entomologist and has made a career out of collecting, documenting, and protecting hundreds of insect species. His specialty is lepidoptera, and when it comes to this area, he wrote the book, literally. It's called Caterpillars of Eastern North America by Princeton Field Guides, and you couldn't find a better guide to the species you'll come across in this region of the country. He was the ideal person to contact for this newspaper story. He's in touch with my PI (that's primary investigator, or my boss) and invited the reporter and some amateur lepidopterists to come out collecting with my lab group. The main event was a nighttime "black-lighting" where lights, especially black lights or mercury vapor lights, are hung up in the woods and grasslands next to sheets which moths are drawn to in droves. No one is quite sure why this happens, though there are many explanations, but it's the most efficient way to collect the largest number of species in one go. I don't want to give away any more of the story, I'll just say to look in unnamed newspaper's Tuesday science section on July 4th for more information. If the story doesn't make it in on that day, check back in a week. It's sure to be accompanied by some impressive pictures, or at least one of Dr. Wagner educating our motley crew. To complement the piece, I've decided to present my own short list of interesting species you can find in your own back yard. Try by checking tree branches and shrubs for caterpillars, or by setting up a white sheet and blacklight somewhere in the wilderness at night for moths. Butterflies can be hunted during the daytime with an insect net and some determination, try fields with tall grasses and wildflowers first. As a reminder, most of the species out there are moths, and the exception to the rule are the butterflies. Many moths are brown or grey, but don't let that deter you, some are spectacular, either as caterpillars or as adult moths, and rival some of the flashier butterflies. For Best All Around, the award goes to the Eastern Tiger Swallowtail aka Papilio glaucus. This is a familiar species to many as a butterfly, but it's got an equally impressive caterpillar or larva. The larva may be found on cherry, tulip tree, ash and other tree species. As a small larva it mimics a bird dropping and as an older larva it's a snake mimic. Those spots on the older green larva aren't it's eyes, but mimicking eye spots. The larva also has osmeteria which it can project out of a spot near its head to scare predators. The adult is magnificent. 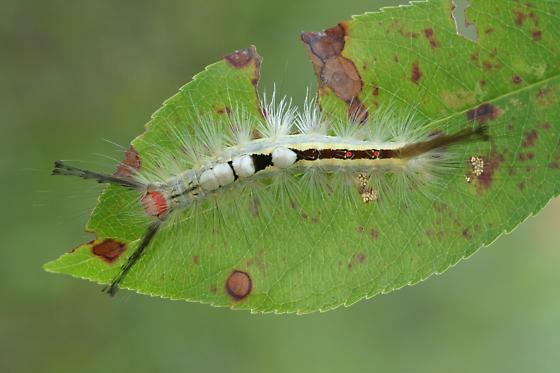 For Flashiest Caterpillar, the award goes to the White-Marked Tussock Moth, or Orgyia leucostigma. Complete with tufts of white or yellow hair, a red head, and a brightly collored body, this caterpillar is distinctive. It is found on just about every woody tree species in the Eastern United States and for much of the summer. The long hairs could cause an allergic reaction, though I haven't had that experience with this particular caterpillar. For "Don't Touch Me" the award goes to the Saddleback Caterpillar, or Acharia stimulea. This beauty can be found in many gardens, on apple trees or blueberry bushes, and a host of other plants. The spines at either end are stinging. If I were giving an award for the caterpillar for which you can't tell one end from the other, this guy would get it. The award for uggliest caterpillar goes to a caterpillar in the same family as the Saddleback, the Monkey Slug or Hag Moth, aka Phobetron pithecium. At first glance this caterpillar looks like a demonic spider, but on further inspection may actually appear cute and fuzzy. The moth isn't so bad looking either with a black and white pattern. Found on many tree species in the Northeast, Dr. Wagner says that there may be credence to the idea that the caterpillar mimics a shed tarantula skin, if the caterpillar is considered primarily a tropical species (tarantulas are found in the tropics and their coexistence with this caterpillar would be required for a true case of mimicry to occur). Finally, the award for most stunning moth goes to the Luna Moth, or Actias luna. This elusive and beautiful species will warm the heart of just about anyone lucky enough to lay eyes upon her. The caterpillar is a nice creature too, but the moth takes the top prize. A newly emerged moth will be a slow flyer and may be found at night with a blacklight. The cocoon of this moth is spun from silk, unlike many other caterpillars which make pupae that are hard and smooth. You should consider yourself lucky to see one of these moths, which may get up to the size of your hand with fingers extended, during your lifetime. This is of course the shortest of lists, and you should see for yourself all the amazing species of caterpillars, moths, and butterflies out there right near where you live. Find one or find hundreds, you're sure to be entertained and amazed no matter which species you come upon. And, don't forget to check out that article this coming Tuesday.